Shri Krishna Janmastami Nail Design!! It was midnight and the cells in the prison where the mighty couple Devaki and Vasudeva were locked was being guarded. The world outside was dark. For Kamsa, whose mind was preoccupied with the thoughts of killing his destroyer, the wait was coming to an end. Devaki, Kansa’s sister was delivering her 8th child who was predicted to be the destroyer of all evil and protector of all goodness. The child was born, the savior of the people from agony and pain finally entered the world in physical forms. Vasudeva feared that his son would be harmed and thus wrapped the baby boy in cloth, put him into a basket and sneaked out of the prison when all the guards were fast asleep by the eternal spells of the child. Lord Krishna was brought to Gokula, where he spent the rest of his childhood. 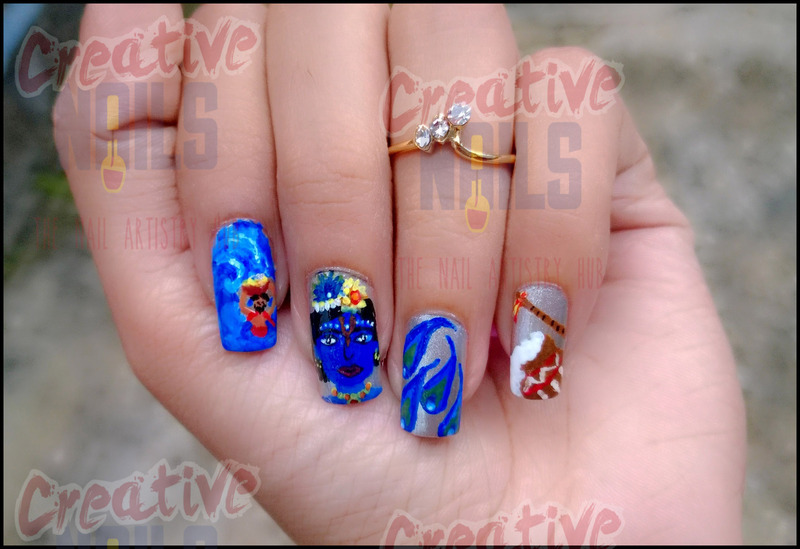 In this nail art, Creative Nails have tried to depict the scene of how Vasudeva carried basket on top of his head when the rains were pouring and the river Yamuna was flooded. Baby Krishna was brought safe, protected and sheltered with the help of the king of snakes right across the river. ← Bansuri – Mor Pankh Nail Design! Perfection! The details are so clear and I love the overall design <3!